Education Fund Deficit 2009-2010 Washington GSD #52 September 2009. 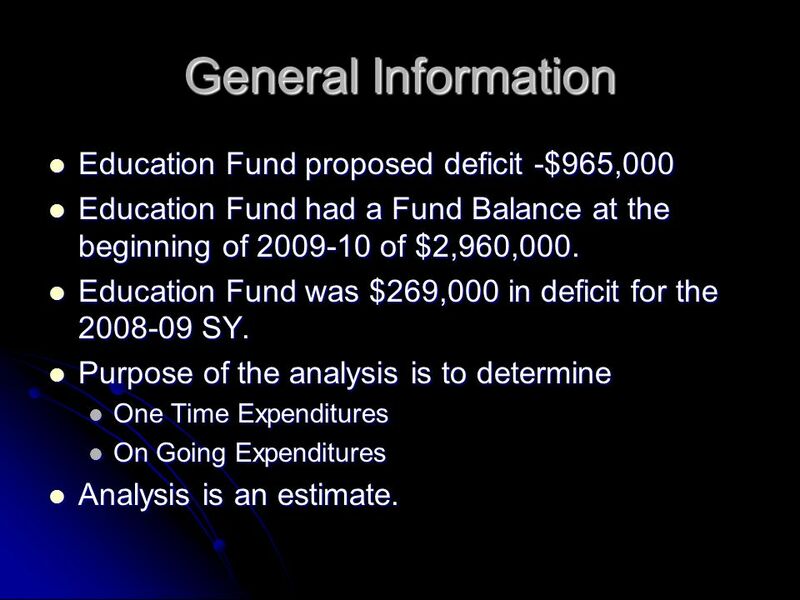 2 General Information Education Fund proposed deficit -$965,000 Education Fund proposed deficit -$965,000 Education Fund had a Fund Balance at the beginning of 2009-10 of $2,960,000. Education Fund had a Fund Balance at the beginning of 2009-10 of $2,960,000. 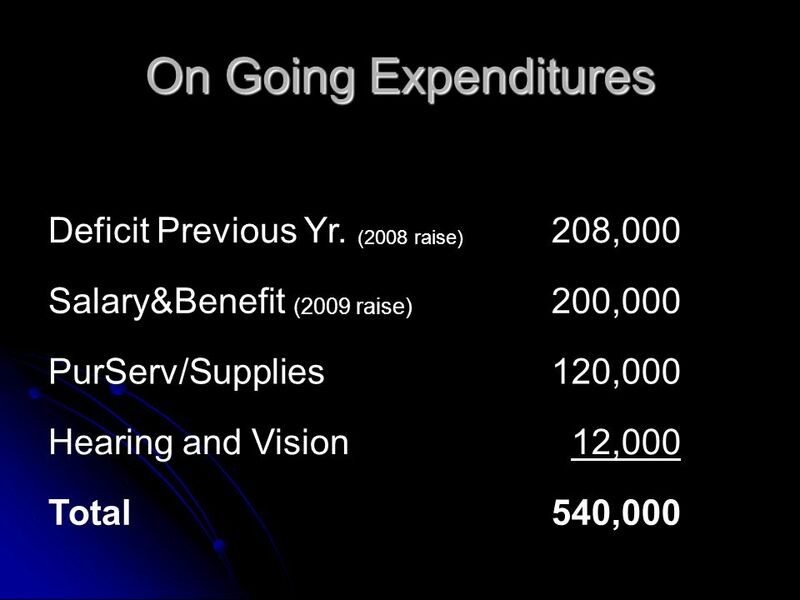 Education Fund was $269,000 in deficit for the 2008-09 SY. Education Fund was $269,000 in deficit for the 2008-09 SY. 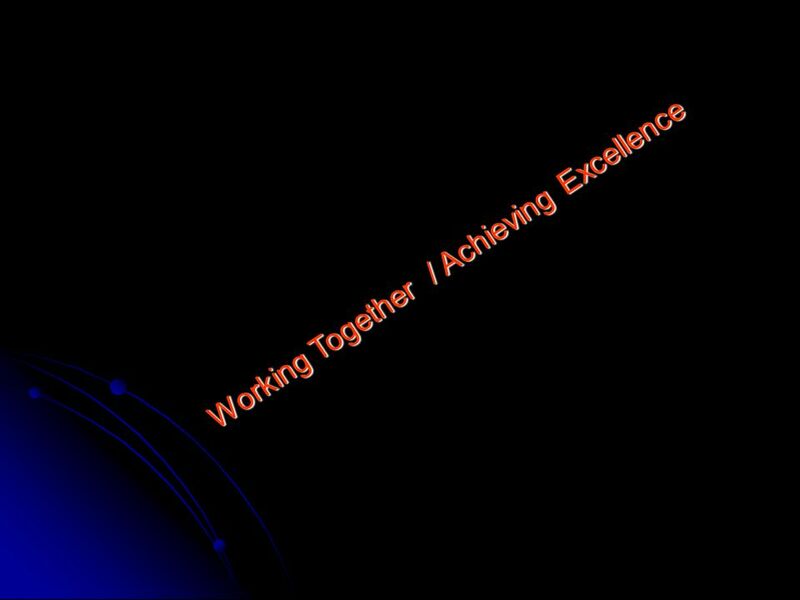 Purpose of the analysis is to determine Purpose of the analysis is to determine One Time Expenditures One Time Expenditures On Going Expenditures On Going Expenditures Analysis is an estimate. Analysis is an estimate. Download ppt "Education Fund Deficit 2009-2010 Washington GSD #52 September 2009." 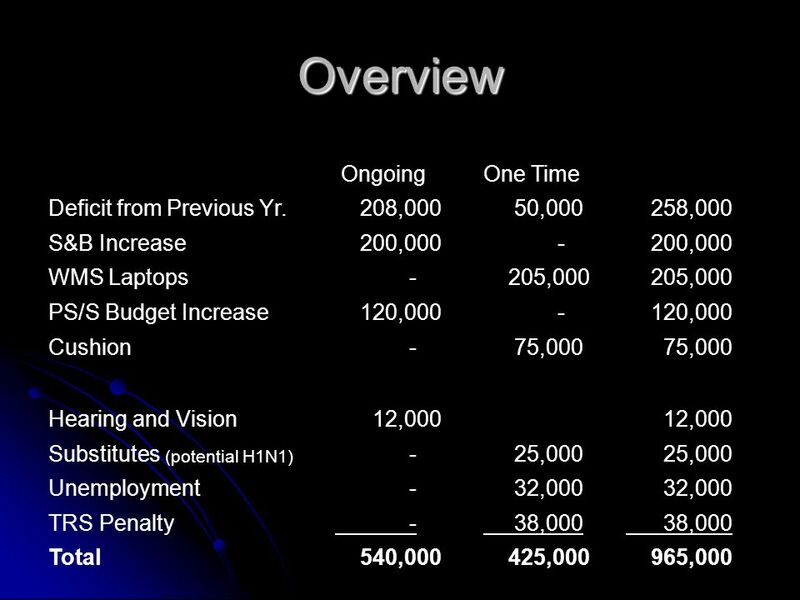 Fiscal Year 2009 Budget. Circulation % Increase. Chapter 7 EM Math Probability. Linux TV Tuner - Implementation overview. Feasibility Study Business Problem The client requires a simple and cost effective solution to watch TV through. Presented by Kristy Hartsell, Fiscal Analyst III Oregon Department of Education OASBO Conference July 2009 LEA Indirect Cost Rate. 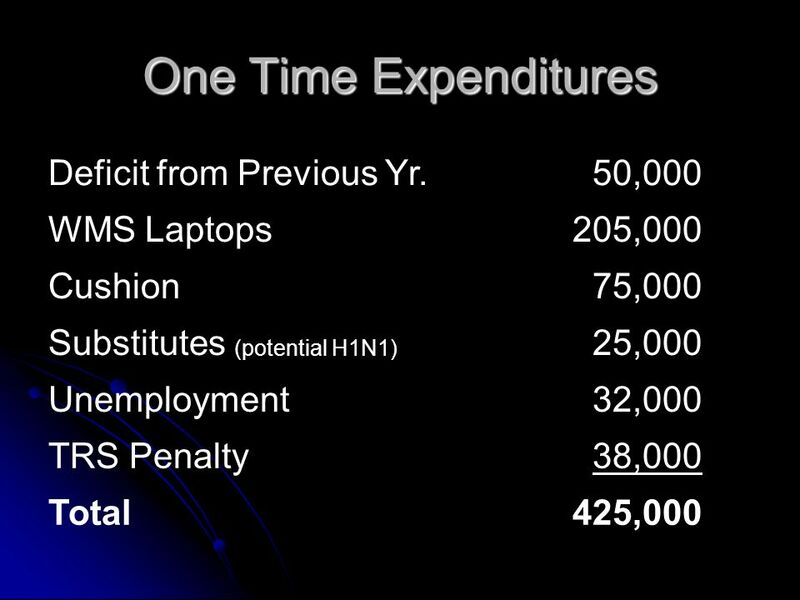 SIGGRAPH Finances Lost $2,800,000 last year – SIGGRAPH $1,900,000 (after ACM) – SA $530,000 + (startup costs) For FY 2011 are under required. Community POWER Partners On Waste Education & Reduction A project of the Solid Waste Management Coordinating Board (SWMCB) Round 9 Selection Process Overview. King Conservation District Grants Allocation Guidance WRIA 8 Salmon Recovery Council March 19, 2009. Saint Louis Public Schools December 2008 Monthly Financial Report December 2008 EXECUTIVE SUMMARY FISCAL YEAR Financial Report December 2008. October 8, Overview Staffing Staffing Enrollment Enrollment Building Capacity Building Capacity Nurses Nurses. May 14, The annual budget presents a complete financial plan and includes the following: Important features and major changes from the preceding. Saint Louis Public Schools FY 08/09 Budget Adoption. September 10, Overview The purpose of the presentation is to provide an update on the status of the opening of school. The purpose of the presentation. May 28, /14/2014St. Louis Public Schools2. The National Connection for Local Public Health Local Health Department Funding Cuts and Impacts. Finance and Audit Committee Judy Walsh FAC Chair April 30, 2009. Wide Area Measurement Communication Network Proposal June 2009 Operating Committee Meeting. May 14, 2009. The annual budget presents a complete financial plan and includes the following: Important features and major changes from the preceding.